The Limerick woman whose story inspired the Oscar nominated film Philomena will return to her home town of Newcastle West for this year’s Éigse Michael Hartnett. 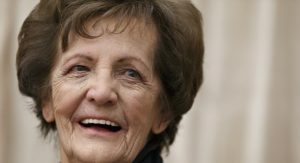 A conversation with Philomena Lee (84) will be one of the highlights of the annual literary festival celebrating the life of the west Limerick poet and writer who passed away in 1999, aged 58. Philomena’s tragic search for the son she was forced to give up for adoption as a teenager was the basis of a book written by journalist Martin Sixsmith, which in turn was made into a critically acclaimed film starring Dame Judy Dench. That story began when, as a young girl of 18, Philomena became pregnant and was sent to Sean Ross Abbey in Roscrea, Co. Tipperary, where her son was born and where they both remained for the next three years, with Philomena working in the laundry and Anthony staying in the nursery. She was forced to put her son up for adoption when an American family arrived. Philomena subsequently moved to England, where she married and had two further children, only eventually revealing the long-kept secret to her children on her 70th birthday. He said he was “absolutely delighted that Philomena Lee would be attending this year’s festival”. Ms Lee will appear on Thursday 6 April at 7.30 pm and will be interviewed on stage by local journalist Seamus Hennessy at Newcastle West Library, Gortboy, where she will speak about her life and her advocacy for adoption rights.